The "Port" of Newbury was unofficially established in 1725 when it became its own parish. This white meetinghouse replaced the original one located in Market Square. It's Weathervame still has a lightning rod designed by Ben Franklin durinmg one of his visits. 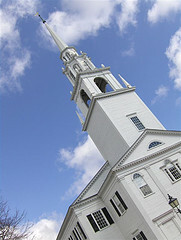 The great architect Samuel Mclntire said that this steeple "rivals anything in New England." Return to State Street and walk uphill until you get to the Newburyport Public Library at the corner of Prince Place. Begin stop 4.